Since having inspected "Zenji" at the Fort Lauderdale Boat Show I became enamored with the depth of thoughtful design behind this series of 56m thoroughbreds Perini Navi has produced. Now numbering 10, they are their own superyacht one-design fleet and may just be the ultimate in world cruising sailing yachts. The 56m series is a collaboration between Perini Navi, Ron Holland Design and a number of interior design firms which have been utilized by the various owners to individualize their yachts. Holland Design has pioneered the fusion of racing performance with superyacht comfort and efficiency over the last several decades. As the designs have become larger and more complex, new materials, technologies and build techniques have allowed builders to create lighter, faster and more efficient yachts requiring fewer crew. This series of limited edition yachts allows for a great deal of customization, far beyond the norm of what we have come to know as "semi-custom". 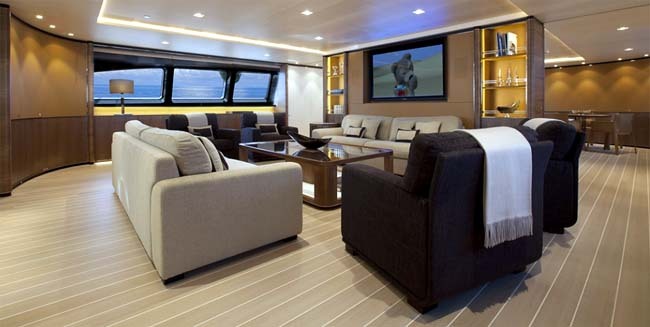 The concept here is not just some flexibility in the layout and interior decor, but rather everything is customizable except the hull and deck structure. This gives a number of advantages over a one-off custom build. With a shared hull /deck design and engineering platform, there are the advantages of reduced build time and cost, as well as the comfort of knowing the design has been tested and proven at sea. While all the yachts in this series share naval architecture and marine engineering, each has its own interior and exterior styling and in some cases even different rigs. Essentially it is the best of both worlds. You are not starting from scratch and experimenting with an unproven concept, yet you have control over all the details to make it your own. 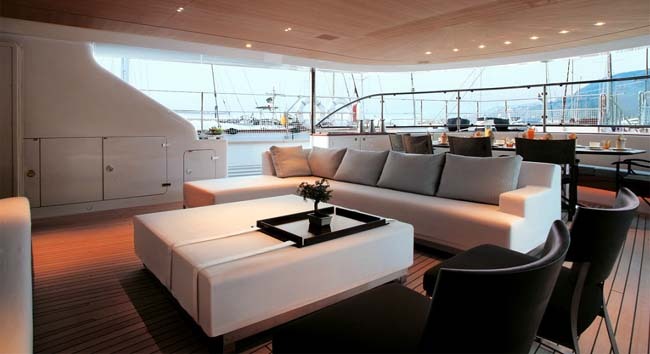 Perini Navi's design innovations are singularly responsible for revitalizing large sail. Thanks to Perini's invention of the captive reel winch and computerized sail handling systems, these yachts become push button sailing machines that would otherwise call for an army of deck apes to handle. All the sail controls are developed and manufactured in house, as are the masts and rigging. Exclusive Perini Navi software monitors yacht performance under sail, and relays the data back to Viareggio for analysis by the design and construction teams. Because of these modern sail handling systems these superyachts are able to carry a sail plan which you would expect to see on a grand prix racer. The performance numbers are off the charts for a vessel of this size and type. The sail area to displacement ratio is 22.62 which rivals some of the numbers you see for racing sailboats. The displacement to length ratio is 158.29 which again is well beyond what we know as a "performance cruiser". Theoretical hull speed is calculated at 16.45, but reports from those lucky enough to be involved in the Perini Navi Cup say the hull can easily exceed this on a broad reach. The light air performance is also surprisingly good, an indication that Holland has the sail area to wetted surface ratio in the right spot. Participants at the PNC Regatta saw 5.5 knots boat speed, with 8 knots true, at 40 degrees to apparent. Not bad at all! Hull and deck construction of the 56m series is entirely aluminum. The weight savings are apparent in the performance numbers. 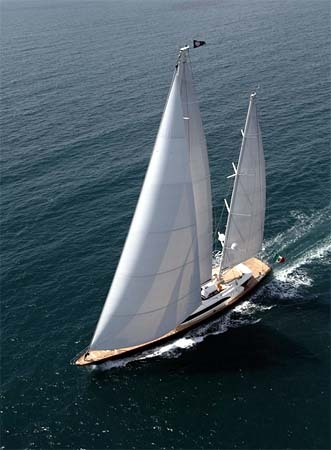 Masts are aluminum with carbon fiber in-boom furling which allows for a 1483 sqm sail plan. Upwind performance and stability are helped by a deep ballasted swing keel set in a shoal ballasted fixed keel. Holland has incorporated a fair amount of beam which carries well aft and serves to add initial stability, as well as providing a tremendous amount of usable volume below decks. This in turn provides owners and interior designs a large palette to work with when designing interior arrangements. I am not sure where Ron Holland's aesthetic influence leaves off and Perini Navi's takes over, but obviously this marriage works. There is no denying that this is a gorgeous hull design. Proportion is everything and to my eye, she's got it all. There is a nice spring in the sheer which goes beautifully with her raked bow. I know there is a move in modern designs to go with a plumb bow, but let's face it........it isn't pretty! There is ample freeboard amidships but with her LOA she manages to look low slung. She finishes with an over hanging reverse transom that balances the rake at the stem, just right. It wasn’t that long ago that we could only dream about a sailing machine of this magnitude which would allow for such power and ease of handling. We are talking about a 56m sailing vessel that can literally be single-handed when underway. Mind boggling! Perini Navi is today’s gold standard for large sailing vessels and I can’t wait to see what’s next.